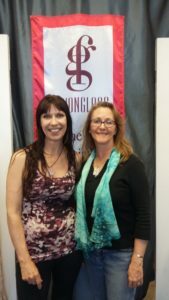 When inconc eivable tragedies hit two friends just months apart, it was their art that brought them through their shared grief and back into the light. Silk painting artist Marjorie Pezzoli’s 19 year-old daughter died in an accidental drowning at La Jolla Cove in January of 2013. Five months before, the boyfriend of glass artist Debbie Solan committed suicide; Debbie found him. Where do you go after that? How do you move on and get our life back? Can you ever really get your life back as you knew it? Marjorie and Debb were already working on a fundraiser, Palette to Palette, sponsored by the San Diego Visual Arts Network (SDVAN) and San Diego Synergy Art Foundation (SAF). 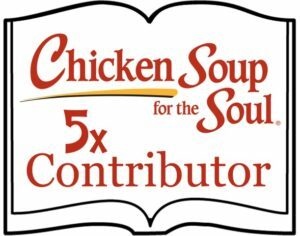 Proceeds benefitted an arts education program at Kimbrough Elementary School, in collaboration with Feeding America San Diego and Young Audiences, as well as ongoing programs of SDVAN and SAF. All very noble, and a distraction, but hard to see the good when tragedy has just taken your joy away. Marjorie and Debbie powered through it as best they could for the greater good, to improve the lives of others. The diversion of another project probably helped too. They were deep into Sea Changes, part of “The DNA of Creativity”, an idea fostered by SDVAN founder, Patricia Frischer. The endeavor brought together the arts and science, usually an incongruent alliance. Not so, in this case. The four projects sponsored by SDVAN involved 40 artists, scientists and educators, all bent on finding ways to showcase art and science together. Each team’s mission was to cultivate an understanding of issues affecting the ecosystem and to prompt innovative, positive change or at least get people to think about the issue. A tall order I’d say. Creative minds that they are, Debbie and Marjorie took the idea to a whole new level. They wanted to address the issue of plastic pollution in the oceans and bays. 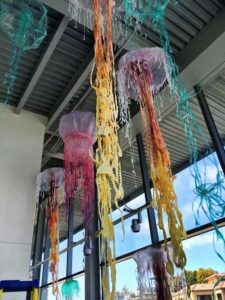 I suppose you just have to be an artist to come up with what was eventually dubbed “Jellies Forever”, a brilliant exhibit in the Museum of Monterey using donated plastic grocery bags, painters’ tarps and salvaged plastic wrap. 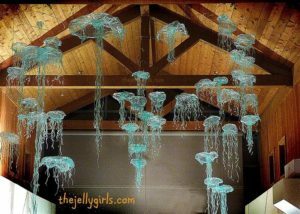 Their exhibit featured life-like jelly fish hanging from the ceiling. Life-like until you took a closer look and realized you were looking at plastic. Though they intended to install six to eight jellies, they ended up spending two days installing 33 and along the way Debbie and Marjorie were dubbed the “Jelly Girls”, a name that stuck. Why crea te plastic jelly fish? If you’ve spent any time at the beaches or on the water you know how sickening it is to see the water teeming with garbage. Many people don’t realize that much of this muck lays underwater plaguing our oceans and strangling sea life; we see a minuscule portion that floats on top. It’s ugly, it’s an infestation. The exhibit ran from March 2014 until early August of that year. 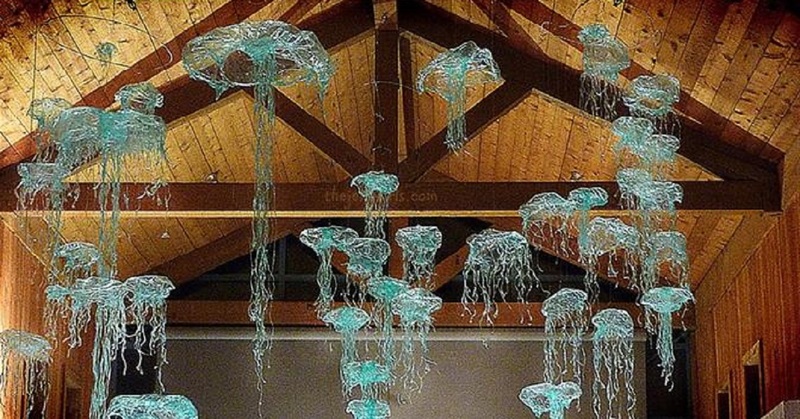 The “jellies” as they have come to be known, can still be seen on display at the Santa Cruz / Monterey Bay Exploration Center as well as in Fusionglass Co, a La Mesa gallery, owned by Debbie Solan and artist Paul Fernandes. But lest you think Fusionglass is a typical gallery, think again. Started in 2007 the little gallery holds special events year round and sells Marjorie’s beautiful painted silks and Debbie and Paul’s glass work, each piece a true work of art. And classes, lots and lots of classes, such as a series called Ladies Night Out where students learn to make their own stunning glass jewelry. (Note to self: gotta sign up for one of those classes.) Fusionglass was a bonafide lifesaver for Marjorie. It’s still hard for them, how could it not be? No doubt their bond and strong friendship has given them the resiliency to muscle through the emotional and psychological difficulties together, to the next chapter of their lives. Marjorie states that going from one creative endeavor to the next motivates her to get through her days, weeks and months, allowing her to function and to live. 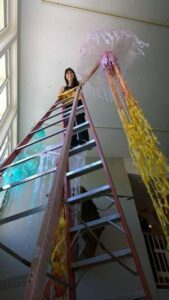 She recently received a certificate from the Teaching Artists Institute; now she teaches art to small children, and when she can, connects her lessons to the work of the ocean and the Jelly Girls because the Jelly Girls has become about more than an exhibit. These days the two dynamic women say that the term has evolved into defining someone who gives back to the community, who creates beauty from materials on hand and who inspires others to care. In other words, thinks outside of herself, thinks of the good. Considering what these two women went through, it’s remarkable that they were able to pick themselves up and find a way out of the sorrow and melancholy that accompanies grief. They did it through their art, through their friendship and through finding a path back to the light when life threw them one of the worst curve balls imaginable. For more information on them, contact Marjorie, Debbie and the Jelly Girls by clicking on their names to link you directly. Inconceivable tragedies hit two friends just months apart. Their tale demonstrates that it was their art that brought them through their shared grief and back into the light. An amazing story. Kristina thank you for sharing our message. It is wonderful to hear how far reaching our project is becoming. “The No Sew T-Shirt Tote”, how to repurposed t-shirts. Our message is a global one, keeps us posted! Debb & I are deeply touched to hear about effects happening in West Africa. Yes, the Jellygirls are on a roll! They are definitely stars of the Sea Changes ACT Project and I loved working with them! Marjorie and Debb are two of the most loving creative people I know. Kira Carrillo Corser had the vision for Sea Changes ACT & continues as a guiding force for ACT 2. We are very happy to be part of her team! Artists put a piece of themselves into each piece of art they create, so it is not surprising that when life wounds us, we turn to our art to express our grief, pain, and anger. By doing so, we exorcise our grief, paid and anger, a little at at time. We can never go back to our lives before the event because there is a hole there where the person we loved used to stand. We have to create a new “normal” for ourselves and go on – the world doesn’t stop turning just because we want it to! susan, your words are powerful and perfectly stated. anytime we experience pain of such magnitude figuring out how to go on without someone you love is a moment by moment, day by day process and we manage some days better than others. thanks so much for sharing your thoughts.